In 1987, Studio Ghibli acquired the rights to a children's novel written by Kadono Eiko, titled Witch's Delivery Service: the story of Kiki, a 13-year-old girl, and the last year of her training as a witch, as she set off for a new town away from her family and had to learn independence and self-sufficiency. It was a suitable subject for an animated children's movie, sure enough, but for a little while, nothing happened with it: directors Miyazaki Hayao and Takahata Isao were still at work on My Neighbor Totoro and Grave of the Fireflies, respectively, and the new project - which was, by the way, still titled Witch's Delivery Service, despite the fact that English speakers have always known it as Kiki's Delivery Service - was at first conceived as a short special, 60 minutes meant to showcase the talents of Studio Ghibli's younger, less well-established, less-famous artists. That plan went a bit awry, for Miyazaki, at this juncture just the film's producer, grew increasingly convinced as the film inched its way through pre-production that none of the directors who had been approached had the right feeling toward the material, and the screenplay that had been written (by an individual whose name is not known to history - to his relief, I suppose) was particularly galling to his sensibilities. 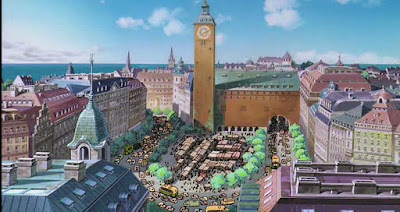 He rewrote the film himself, and in the absence of a director, led the pre-production team (including character designer Oga Kazuo and production designer Ohno Hiroshi) on a tour of European cities that would ultimately serve as inspiration for the film's fictional, geographically indefinite town of Koriko. 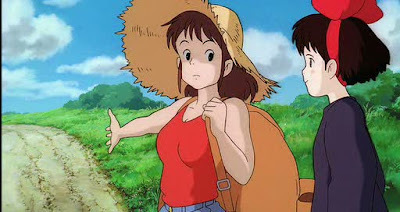 By the time Miyazaki and crew returned to Japan, he'd basically become its director, a decision that was not formally announced until July, 1988, after he'd finished the screenplay (and in the process earned the ire of Kadono, who was not pleased with Miyazaki's increased drama, and the emphasis on Kiki's setbacks as a means to sculpt the narrative; ultimately she allowed the film to continue, though she has apparently never warmed to it). The film was completed and released a year after that, no longer a short special, but the fourth theatrical release produced by Ghibli, and the fifth by its director. I have absolutely no doubt that then as now, Miyazaki does not put his name to any project that he is not certain of, that he has not completed to his exact wishes. But there's something about Kiki's Delivery Service that suggests, in an indirect way, that it wasn't necessarily a project that came from the filmmaker's heart and soul. Not because of anything within itself - by all means, it's a wonderfully fun movie, sweet and humanist and warm - but because, stacked next to Miyazaki's run of films leading up to it (and it is just for that stacking that we're all here), it lacks a certain measure of urgency. His last feature, My Neighbor Totoro, was a deeply personal film that explores the imaginative possibilities of childhood with the gravest sincerity and untrammeled delight; both Laputa: Castle in the Sky and Nausicaä of the Valley of the Wind before that are epic adventures in world-building and myth-making. Compared to all of that, Kiki's Delivery Service is a bit slight, and not just because it has very little plot to it - certainly, it has more plot and conflict than Totoro. I suppose what I'm driving at is that I can't quite put my finger on the "why" - what about this film drove the director to such lengths to make sure it was exactly perfect? It's all kinds of charming, but for me, at least, it never quite hits the euphoric heights of some of the director's earlier work: the emotions simply aren't as full and rich here, in what's ultimately a well-realised but fairly straightforward coming-of-age tale. There's not much more to the story than what I've already implied: Kiki (Takayama Minami) leaves home in accordance with the traditions of her profession, taking with her only three mementos of her past: her father's radio, her mother's broom, and her familiar, a black cat named Jiji (Sakuma Rei), with whom she can speak, and who is the only true friend she has. She finds herself for the first time in a bustling metropolis, and though she quickly befriends a local baker, Osono (Toda Keiko), and a painter living in the woods, Ursula (also voiced by Takayama, underlining the degree to which this young woman is something of an older, wiser version of Kiki herself), she finds herself no closer than before to self-reliance and independence. Her only useful skill is her ability to fly, and thus she has decided that her official job as a witch shall be to courier packages, but few people demand her services, and she slips quietly into a depressive insecurity, while the signifiers of her childhood eventually fall away from her, and she is left with neither success nor comfort in this big new world. This is a Miyazaki film, not an Antonioni film, so of course she is eventually given the opportunity to prove herself, and to become a successful young adult. Still, the predominant mode of the story is not triumph (the happy ending has to share space with the end credits), but of uncertainty. For that alone, it's hard to deny that there's some real power to Kiki's Delivery Service, probably more than I give it credit for. It's the furthest thing from dour or miserable, buoyed up by an energetic score by Miyazaki's regular composer Joe Hisaishi, and playful characters, but the core of the film is serious and entirely unwilling to lie to its presumptive child audience: growing up is hard, necessary work. Also keeping the film from every slipping too far from good cheer and whimsy is its bright, clean palette: it's the most boldly-colored Miyazaki film since Nausicaä. It should not come as any surprise that Kiki's Delivery Service is an absolutely gorgeous movie, although for the first time in Miyazak's Studio Ghibli years, the lovely visuals feel a bit more like cartoons than otherwise. That's no sin, of course: there is an honesty and artistic purity to cartoons. I present this more in the spirit of observation than of critique: the film is bright and round and easy on the eyes, and it's simply not, on the whole, as visionary as Nausicaä or as haunting as Totoro for that reason. Not that it lacks for artistic ambition: the depiction of Koriko, a pan-European blend of influences both architectural and chronological, is as breathtaking as anything in Miyazaki's earlier films. 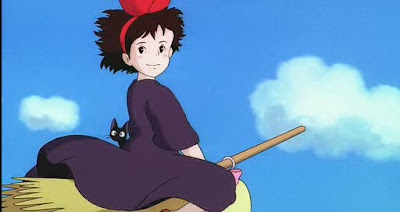 It is, however, mainly more of a cartoon this, and ultimately for the good; for if Kiki's Delivery Service weren't a cartoon, then we wouldn't have the joy of its, well, its cartoonishness. Some of the film's most successful elements are those which are the simplest and most childish, and I'd argue that the chief of these is Jiji, who is an absolutely delightful little character if ever I've seen one. He's not as cute as the Totoros, p'raps - nothing is as cute as the Totoros, but given a whispy, light voice and a magnificently expressive face that gives him the feeling of a solemn, saracastic preteen, Jiji is immensely appealing, but he's hardly just a device to sell toys. 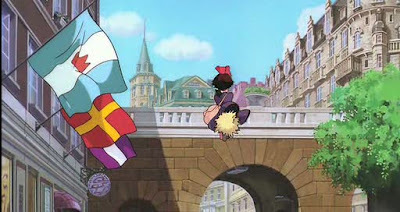 In the film, his function is to be Kiki's other self, the only being she can depend on, and the only being she wants to depend on - but this means that he can't come with her on her development into adulthood. And the moment that this first manifests itself is as heartbreaking to the audience as it is to the witch. 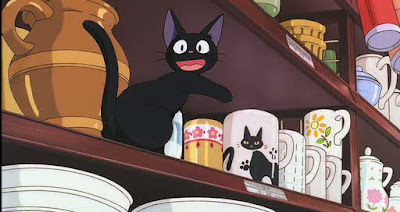 In essence, our (presumptive) affection for Jiji as a cartoon character mirrors Kiki's relationship to him, which is probably the subtlest and most effective of all the film's attempts to link our perspective to hers. There you have it: I attempt to praise the film for its silly talking cat, and in the space of a paragraph, I get back to Miyazaki's author-angering focus on the loss of innocence. 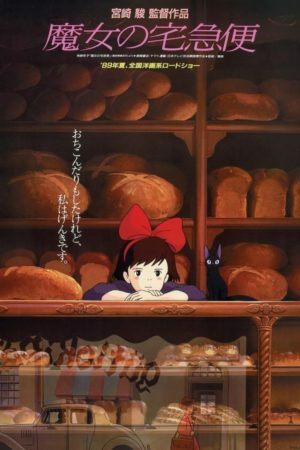 So plainly, Kiki's Delivery Service is more than just a fun kid's movie, although it's that. It still showcases the director's effortless ability to respect the perspective of childhood as well as any of his other films do; as in Totoro, the existence of magic is neither foregrounded nor commented upon, but simply a fact. Nor is the idea that a 13-year-old girl should be ready to stand on her own two feet questioned by anyone but characters who we're meant to understand as misguided. It is a sensible, nice film that assumes there is a certain intelligence to the young that is not the same thing as precocious wisdom, and shows once again why Miyazaki is one of the best family filmmakers in history. I cannot explain why it is that I'm thus left a touch cold by it: maybe because the story doesn't feel quite as organic as some of his other films, maybe it's because the director wasn't working from something that came from his own imagination and passions, and maybe it's because nothing that came in the wake of Totoro> could possibly satisfy me, not even a fine, sincere piece of bittersweet delight like this.